What is Blue Buffalo Adult Dry Dog Food? Made for adult breeds, Blue Buffalo Adult Dry Dog Food contains essential amino acids, complex carbohydrates, and nutrient-rich vegetables to help your dog maintain his life-stage requirements while providing a satisfying meal. Cold-formed to retain flavor and nutrient potency, the all-natural Blue Buffalo Adult Dry Dog Food is available in three tasty flavors: Chicken & Brown Rice, Lamb & Brown Rice, and Fish & Sweet Potato. Blue Buffalo Adult Dry Dog Food guarantees that this formula is free from chicken and poultry by-products, corn, soy, wheat, artificial flavors, and artificial colors and preservatives. How does Blue Buffalo Adult Dry Dog Food work? Blue Buffalo Adult Dry Dog Food is holistically formulated to provide your dog with the necessary proteins, vitamins, and minerals to help support healthy muscle development, maintain joint health, increase energy levels, and maintain life-stage requirements. Always provide plenty of fresh water in a clean bowl to ensure proper digestion. Your dog's feeding requirements depend on age, breed, activity level, and environment. If you are unsure how much to feed your dog, be sure to consult a veterinarian. When transitioning from a different food, mix 25 percent of Blue Buffalo Adult Dry Dog Food with your dog's regular food, gradually increasing the portion over the next 14 days. Small breed dogs require one meal per day. Medium and large breeds require two meals per day. For maximum flavor and aroma, mix a small amount of water with the all-natural dog food. To help maintain freshness, seal the bag tightly and store in a cool and dry location. Ingredients: Deboned Chicken, Chicken Meal, Whole Ground Brown Rice, Whole Ground Barley, Oatmeal, Chicken Fat (preserved with Mixed Tocopherols), Peas, Tomato Pomace (source of Lycopene), Natural Chicken Flavor, Whole Potatoes, Flaxseed (source of Omega 3 and 6 Fatty Acids), Alfalfa Meal, Whole Carrots, Whole Sweet Potatoes, Blueberries, Cranberries, Barley Grass, Dried Parsley, Garlic, Dried Kelp, Yucca Schidigera Extract, L-Carnitine, L-Lysine, Glucosamine Hydrochloride, Turmeric, Sunflower Oil (source of Omega 6 Fatty Acids), Fish Oil (source of Omega 3 Fatty Acids), Dried Chicory Root, Oil of Rosemary, Beta Carotene, Vitamin A Supplement, Thiamine Mononitrate (Vitamin B1), Riboflavin (Vitamin B2), Niacin (Vitamin B3), d-Calcium Pantothenate (Vitamin B5), Pyridoxine Hydrochloride (Vitamin B6), Biotin (Vitamin B7), Folic Acid (Vitamin B9), Vitamin B12 Supplement, Calcium Ascorbate (source of Vitamin C), Vitamin D3 Supplement, Vitamin E Supplement, Iron Amino Acid Chelate, Zinc Amino Acid Chelate, Manganese Amino Acid Chelate, Copper Amino Acid Chelate, Choline Chloride, Sodium Selenite, Calcium Iodate, Salt, Caramel, Potassium Chloride, Dicalcium Phosphate, Dried Yeast (source of Saccharomyces cerevisiae), Dried Lactobacillus acidophilus fermentation product, Dried Bacillus subtilis fermentation product, Dried Enterococcus faecium fermentation product. 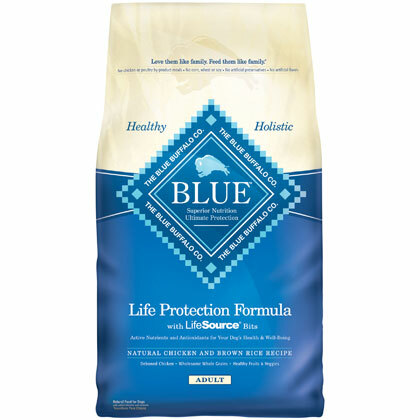 Nutrition Statement: BLUE Life Protection Formula Chicken & Brown Rice Recipe for Adult Dogs is formulated to meet the nutritional levels established by the AAFCO Dog Food Nutrient Profiles for maintenance.